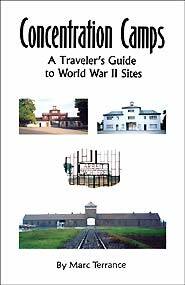 Concentration Camps: A Traveler's Guide to World War II Sites is a MUST for anyone planning on visiting these memorials. It contains 45 street maps showing the exact directions to the sites, in most cases how to walk from the nearest train stations to the camps! Includes road signs, bus and train information, opening hours, addresses, phone/fax numbers, email and many useful websites for more information. Over 160 photos lead you on your journey through Poland, Austria, Germany, the Czech Republic, France and The Netherlands. This concise, detail-filled guide will help you along your way and open your eyes to the atrocities that occurred during the Holocaust. Whether you are a survivor of the camps, a history student or simply a traveler in search of a better understanding of this subject, this material will answer many of your questions such as: Is there a memorial? What remains of the camps today? Is it worth the trip? How much time do I need to schedule for my visit? Is there an entrance fee? and much more. The author sincerely hopes that those visiting these memorials will learn something from their experience. These were terrible times we must Never Forget, and we must say, NEVER AGAIN!